The Penn State Nittany Lions and Washington Huskies began the season with hopes that they would end it in the same place. Both teams hoped they would finish the season in Atlanta playing for the National Championship. Instead, they are ending it in Glendale, Arizona, at the Fiesta Bowl. Washington made it to the CFB Semifinals last season. But this season, the team didn’t seem to have the offensive firepower that it had last year. They still had Jake Browning at quarterback and Myles Gaskin running the ball. But no one was able to step up and fill the shoes John Ross left empty when he entered the draft. Last season, Browning threw 43 touchdowns and just nine interceptions for the nations 41st ranked passing offense. This season, he has just 18, and the Washington passing game is ranked 72nd. As for Penn State, many thought they deserved to be in the CFP Semifinals last season even though they started the season 2-2. They ended the season on a nine-game winning streak and looked unbeatable (which USC proved they were in the Rose Bowl). So, entering the 2017 season, many expected the Nittany Lions to be in the hunt and make the Final Four. They seemed to be headed in that direction the first seven games of the season. Trace McSorley was playing lights out football and making plays whenever Saquon Barkley didn’t. But then things fell apart in the second half against Ohio State, and they lost a close one the following week to Michigan State. Much like two-loss Washington, two-loss Penn State deserved one of the better bowl games. But not the one they wanted to be in. But the end of the season comes when the final whistle blows in Glendale Saturday night. No one wants to end the season with a loss—but someone must. Last season, the Huskies were all about the passing game and playing good defense. This season, they are capable of passing the ball, but they do more damage with the running game, defense, and special teams. Myles Gaskin is one of the better running backs in the country and helped give Washington a solid rushing attack every week (189.8 yards/game; No. 38). While he gained a few more yards on the ground last season, he increased his per carry average to 6.2 yards and almost doubled his scoring output (19 touchdowns; 10 last season). 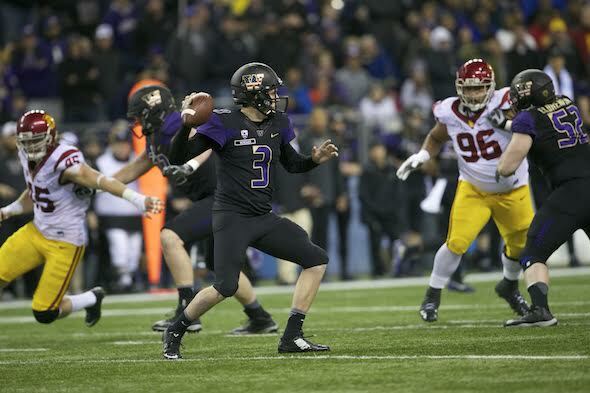 Browning was still one of the more accurate passers in the country this season (68.8 percent), but he missed not having John Ross. Dante Pettis did his best to fill the void (62 receptions for 721 yards and seven touchdowns). But Pettis was more of a threat on special teams. With four punt returns for touchdowns this season he set the NCAA FBS career record with nine. But Washington’s most valuable weapon against Penn State may be their defense. It’s ranked fifth in the country in total yards allowed (277.4 yards/game allowed), first against the run (92.3 yards/game), and 21st against the pass (185.1 yards/game). Their defense will have to be at their best if they hope to contain Saquon Barkley. Penn State appeared to struggle to get him involved in some games. But he still finished the regular season ranked second in the nation in all-purpose yards. So, if they don’t contain him, he’ll be more than happy to run wild and win the game. But if they do, it will still not be easy to win. McSorley is an accurate passer without a favorite receiver for defenses can focus on. During the regular season, DaeSean Hamilton had 48 receptions, Juwan Johnson also had 48, Barkley had 47, and tight end Mike Gesicki had 51. Washington has some good players on offense. But they may not have enough good ones to score much against a very good Penn State defense. Their defense will make life hard on Penn State’s offense. But it is hard to imagine them shutting the Nittany Lions down. It will likely be a close, hard-fought game that could very well come down to whoever has the ball last. Penn State is a two-point favorite; expect them to win.